Black Rock at the Sheraton Kaanapali is clear with a sandy bottom out to 30’ deep. Turtles graze there. Old Airport is where the old airport used to was. Shoreline access is on Kai Ala Drive off Hwy 30. Facilities & parking with a sandy beach make this a good spot for watching fish while sucking air through a plastic tube. Napili Bay is behind me, Snorkel Bob, in Napili. Sandy beach & blue water make it home for millions. Exit at Napili off Hwy 30, go down to the stop sign & then right for ½ mile. 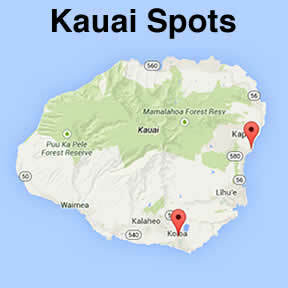 Kapalua Bay is ¼ mile past Snorkel Bob’s, Napili, on lower Honoapiilani Rd. Take the 1st left after Napili Kai Beach Resort. Use the stairs by the restrooms & showers. 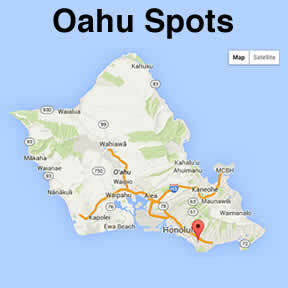 Olowalu is between Kihei & Lahaina at Mile Marker 14. This prolific reef will keep you busy. Charley Young’s is at the rocks at the north end of Kam 1. Kams 1, 2 & 3 on S. Kihei Road have facilities. Lava outcroppings between the Kamaole Beach Parks make for good snorkeling. Ulua/Mokapu Beach is off Wailea Alanui Drive between the Marriott & Andaz hotels. The lava rock outcropping between the two beaches is prolific habitat. Parking & facilities. Polo Beach—turn right down to the beach just past the Fairmont Kealani on Wailea Alanui Dr.
Makena Landing is past Makena Surf. Look for blue Makena Landing sign on right. Turn right on Honoiki St., then right at STOP sign. Turn left into Makena Landing parking. Enter at sandy inlet, snorkel right. The Makena Beach and Golf Resort reef fronts the hotel. 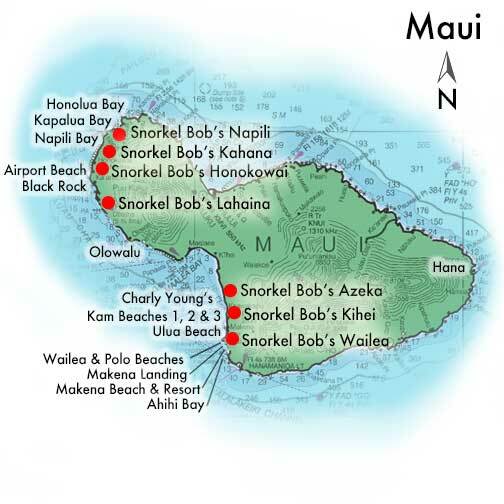 Enter left and cruise out, like Ulua but left to 20’ with turtles, fish, showers, changing rooms & parking. Makena Beach State Park (Big Beach) is beauteous but Danger! SHORE BREAK CAN HURT YOU! (neck, shoulder, head!) I, Snorkel Bob, do NOT recommend Makena Beach for snorkeling or bodyboarding. 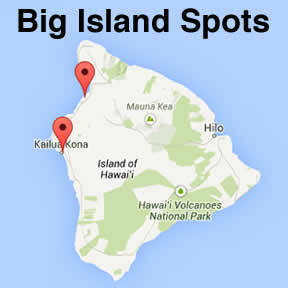 Ahihi Bay Marine Reserve is past hotels and Makena. Road narrows along coastline. 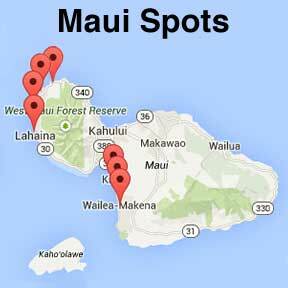 Look for Ahihi Kinau sign and, “parking lot ¼ mile ahead.” Drive past the bay, park. Snorkel the bay or at Dumps near parking. The Great Snorkel Byway is profuse. Always ask about surf, surge, current, visibility & safety.